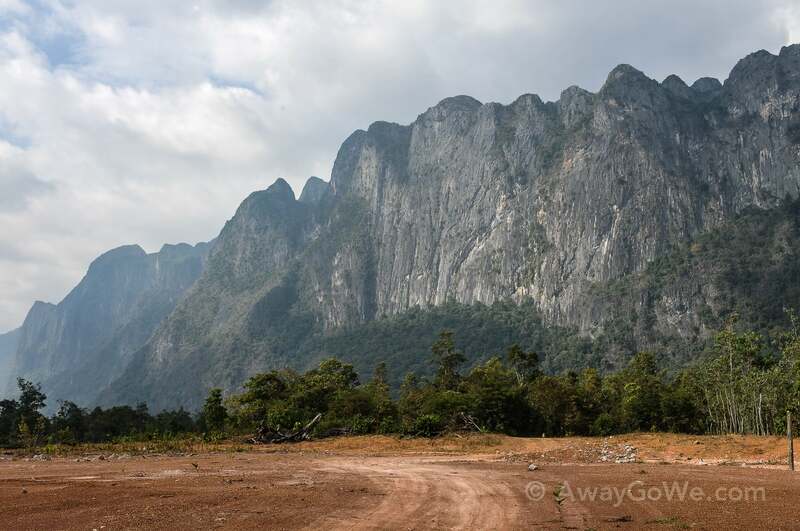 On Day Two of our Thakhek Loop motorbiking adventure in Laos we ride from ThaLang to NaHin via Laksao, covering some of the most remote, rugged and unforgiving roads Laos has to offer. what’s changed and what’s stayed the same! Read about Day One and how we ended up in this remote and wonderful place. 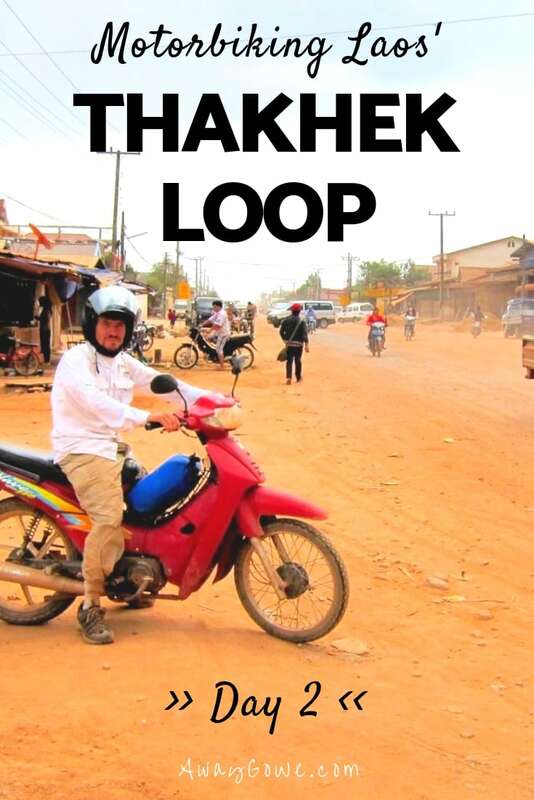 Most riders attempting the Loop usually shoot for returning to Thakhek in 2-3 full days of riding. That didn’t appeal to Lori and I. It was important to us to do the Loop with an open-ended itinerary. We recognized that it was a once in a lifetime experience — a unique one at that — so why rush it? Yet, we were surprised with the number of people who rush their travel, especially through Laos. 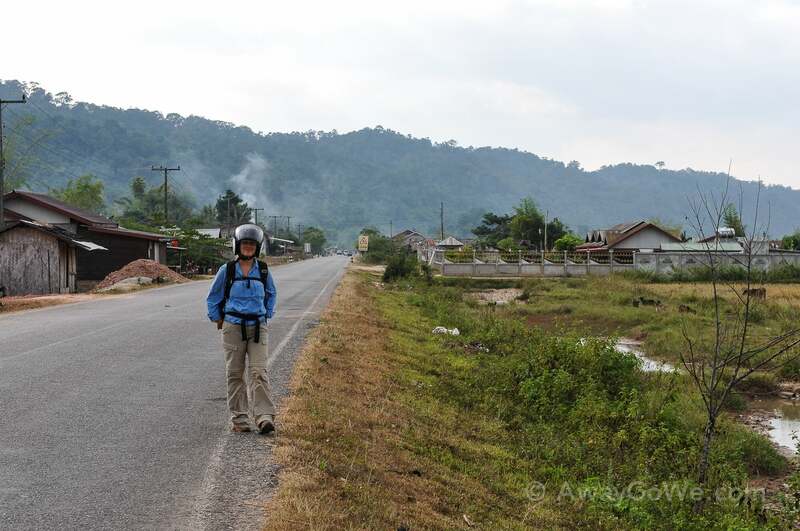 Laos, for most backpackers, seems to be nothing but a transit country, and this is extremely unfortunate (for them, but better for us!) 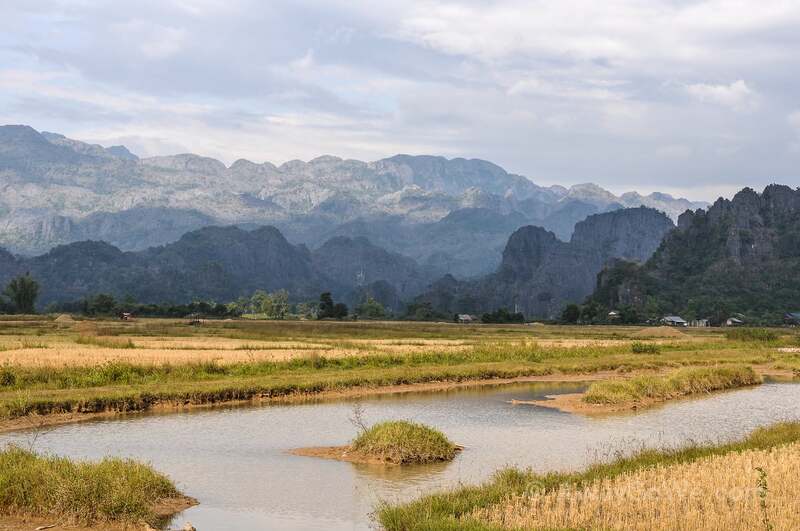 We realize that we were dealing with a lot more travel time overall than many others, but to our surprise we had devoted a lot more time to Laos than even people with four months to lend to Southeast Asia alone. 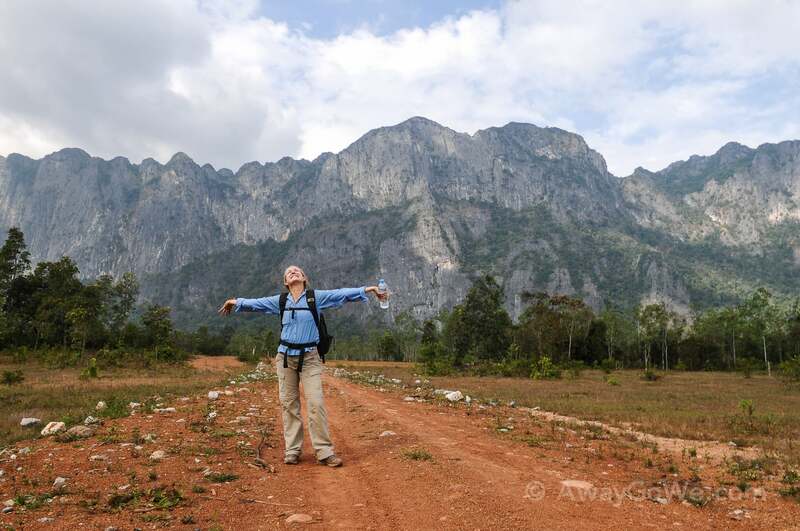 Bottom line, if you’re planning on backpacking through Laos (not touring, not flashpacking, but traveling low and slow) take the amount of time you originally alotted to Laos and DOUBLE or TRIPLE IT. This place is what backpacking is all about. 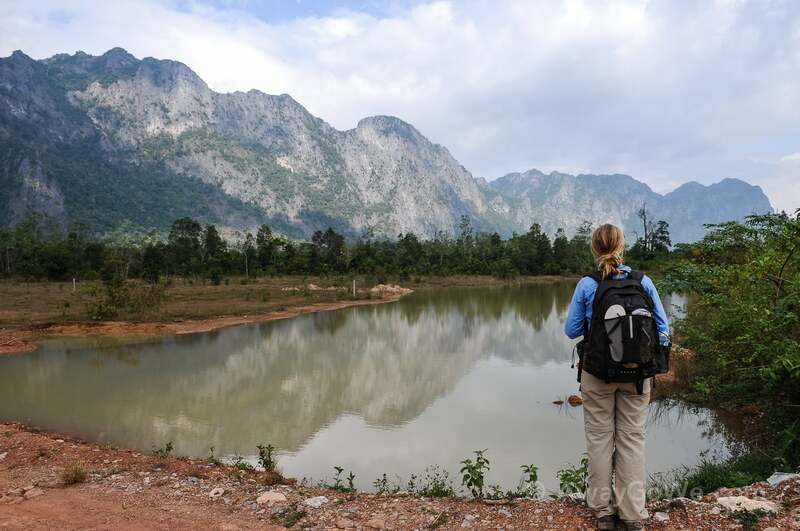 You won’t get your fix in Vietnam or Cambodia unless you invest a lot of time and effort in getting up and off the Trail, and you certainly won’t get your fix in Thailand. 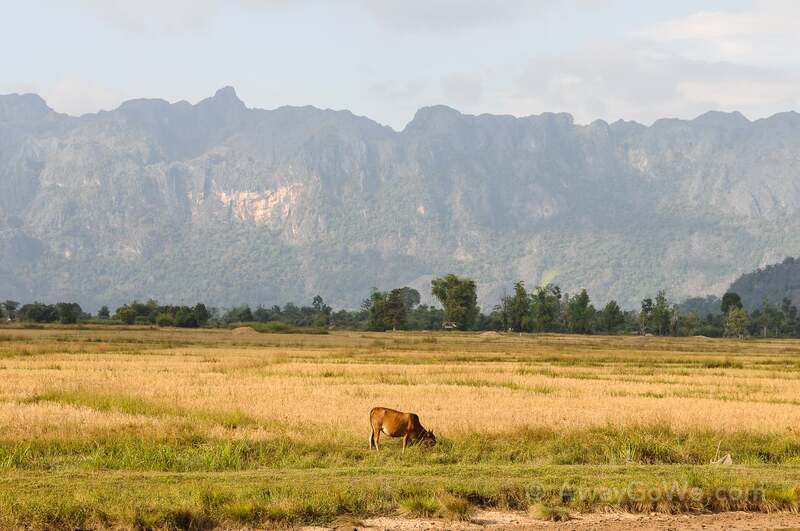 Laos is the real deal. Alright, on with the journey! 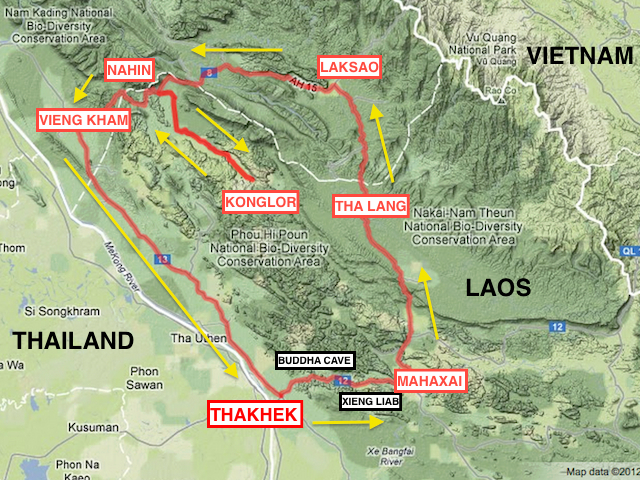 Map of the Khammouane Loop. So Day 2 begins in Tha Lang. We woke up that morning having no idea where we’d be laying our heads that night, and it was a fantastic feeling. We knew that within an hour of getting on the road we would encounter the most difficult part of the journey, which we had been told would take several hours to complete the short leg. Conditions were about as good as it gets for riding, but we still planned to take it slow. 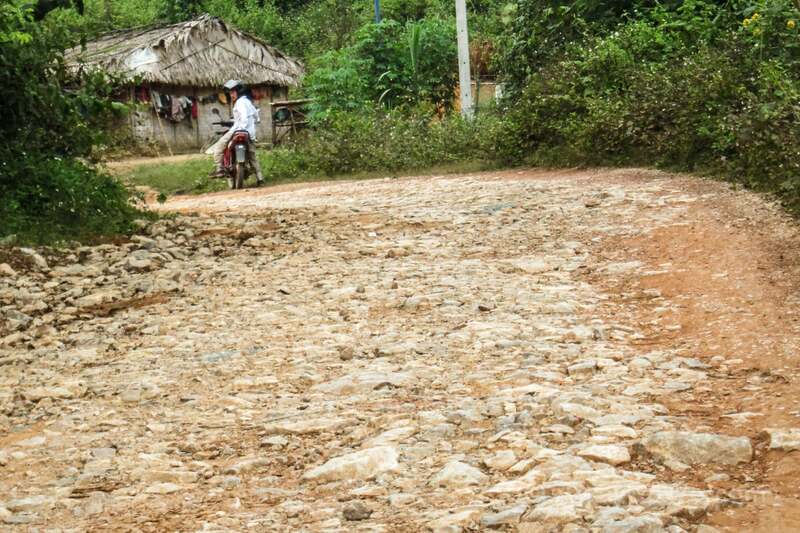 Therefore, we agreed to just make it to Laksao, where the road apparently improves considerably, and assess things then. 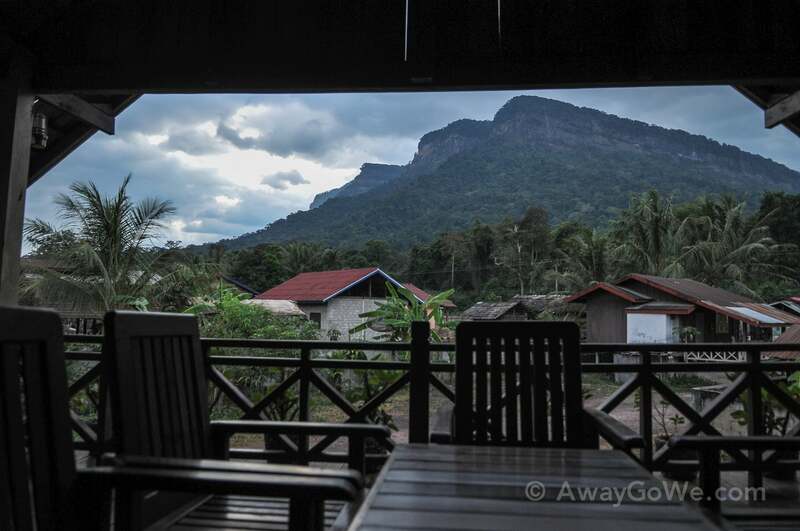 We had also read that the area around Laksao is gorgeous and that there are a couple of good lodging options. We had a hearty breakfast on the outside patio of the restaurant at Phosy Guesthouse before mounting up. The sun was shining, and the temperature was just about perfect. We were well rested, albeit a bit sore from riding the previous day, but ready for an adventure. I’ll go ahead and say it, that morning was perhaps the most nerve-wracking of our entire six-month trip for me. I’ve gotten to the point where I generally feel comfortable on the move in unknown places. Certain things may frustrate me to no end, but, aside from close rail or airline connections, I rarely get nervous while backpacking. This particular morning was an exception. Leaving Posy Guesthouse — note the red plastic bottles under the umbrella. This is the only source of fuel over most of the Loop, and luckily, one of the few things you can count on seeing at regular intervals. 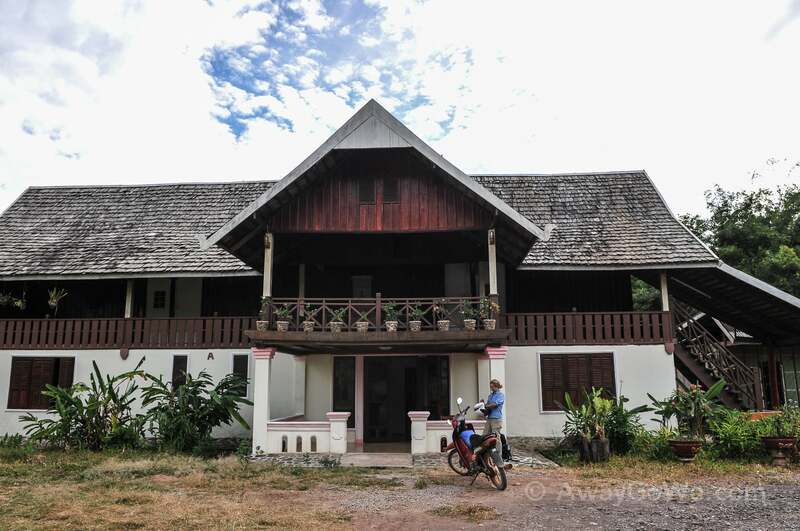 I had read up on what to expect, and perused the riding log at Thakhek Travel Lodge in detail, but for all of our preparedness, I couldn’t shake the image of the Asian couple at breakfast the morning prior. 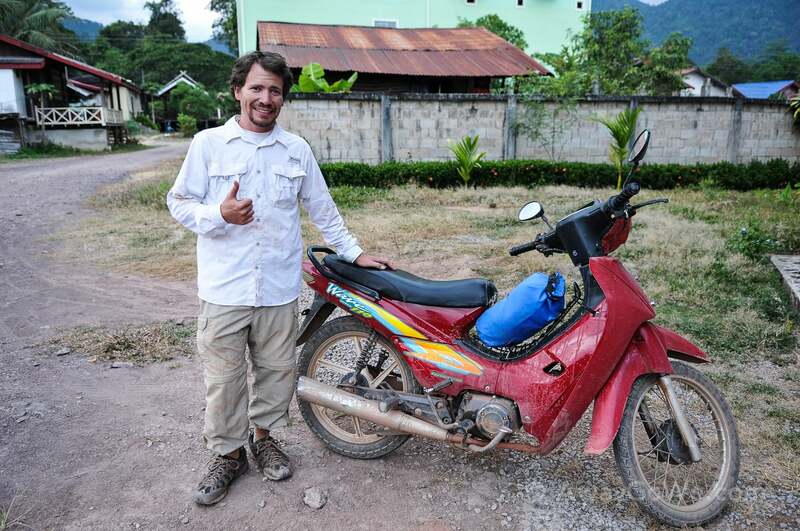 Nor could I escape the fact that our bike was a piece of crap and I hadn’t much confidence in its ability to carry us without incident over anything but maintained road — and even that was with a large dose of faith and finger-crossing. 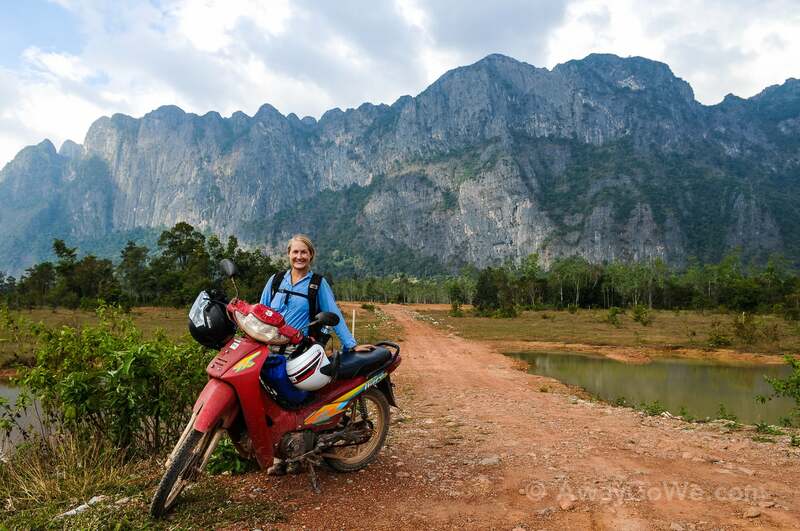 I had visions of tires disintegrating at the first view of rocky terrain, brakes giving out at the most inopportune time, or stopping for a bathroom break in the middle of nowhere and not being able to get the thing to start. Yet, my thoughts always returned to the fact that people do this each and every day, returning safely to Thakhek in good time. As long as we could avoid serious bodily injury, we’d be ok, and any lesser mishap we’d chock up to part of the adventure. The first 40 minutes were a breeze. While we had left the sealed road behind the previous day, this road was well-maintained, albeit covered in loose gravel. 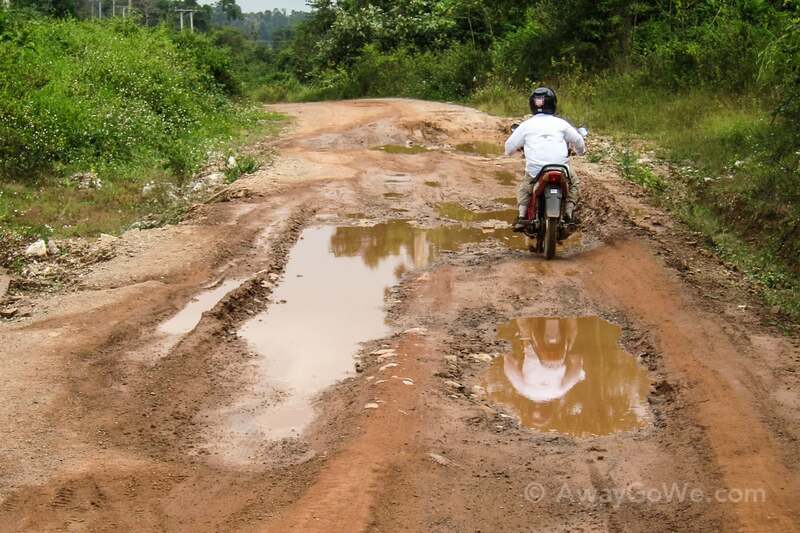 It’s not the most fun surface to try to ride a small, squirrelly plastic motorbike on, but if you’re careful and confident you can generally make good time on these surfaces. — but what an incredibly fun ride! This was some of the most enjoyable riding of the whole trip. 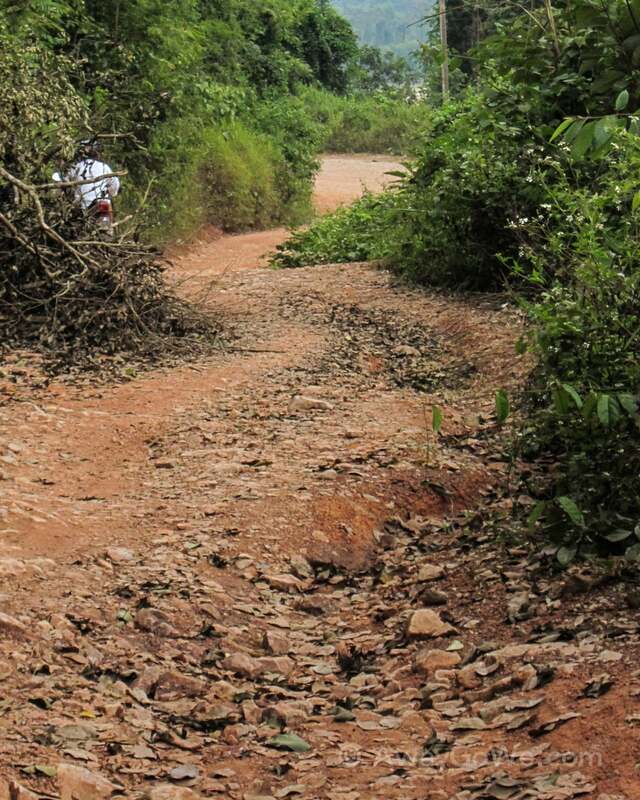 Granted, we weren’t making great time, but the packed red clay surface — sporting huge ruts and potholes — always seemed to provide a clearly defined way through. I found that if I rode slowly and aggressively enough, using the entire width of the road, I could keep it a fairly smooth ride for Lori holding on on back. Plus, the tires seemed to really take to the packed clay. Occasionally, we’d hit some deep ruts filled with muddy water and Lori would hop off momentarily in case we got stuck. As a result, I ended up covered from head to toe in red mud while Lori managed to stay fairly tidy. It was an absolute blast, and I was looking forward to a whole morning of this. The occasional mud-filled ruts at the end of the wet season. 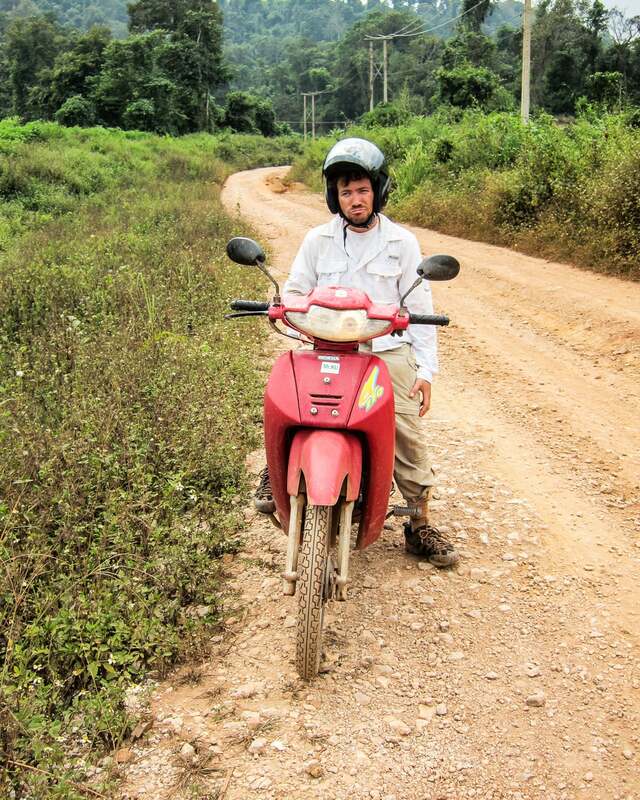 After a while of riding on packed clay, we arrived at a small junction, though we didn’t realize it at first. 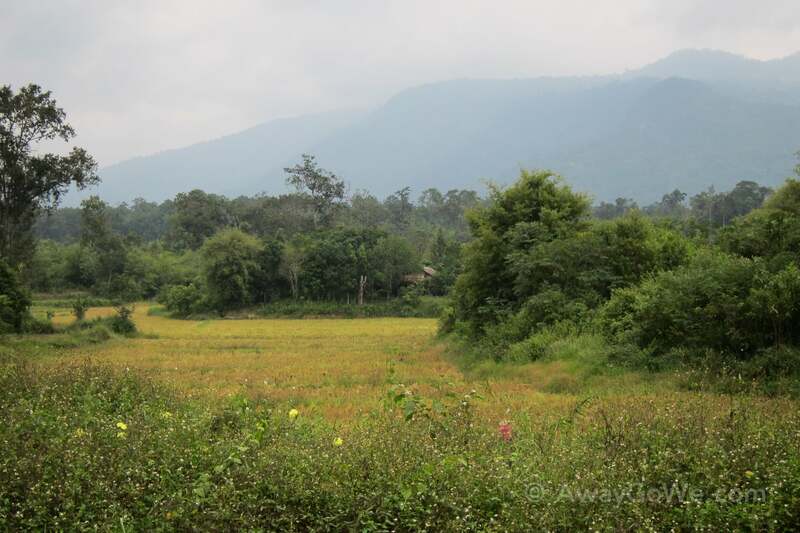 Initially, it seemed that we were out of the woods and the road made a sharp left before morphing into a wide, beautiful and exquisitely maintained dirt road stretching out as far as the eye could see! But something wasn’t quite right. Our hand-written map suggested that we would continue straight ahead here. Yet all that lay in that direction was the most wretched road I had ever seen, if you could even call it a road. At best it was a footpath, at worst it looked like nothing more than a washed-out gulch. Left: beautiful highway; Right: gulch. A no-brainer, right? It had to be! But an aching feeling deep down kept telling me otherwise. I spotted a shopkeeper nearby and asked: “Laksao?” pointing left and nodding. Perhaps she misunderstood me the first time: “No, LAK-SAO? YA?” pointing left again. The woman gave me a look as if I were a complete idiot, took a step out of her shop, turned to the right, facing dead-ahead, and said once again, “LAK-SAO,” before turning on her heel and retiring to the peace and quiet of her shop. I looked over at Lori and could tell she was thinking the same thing. Lori snapping a shot of me staring in shock at the gulch ahead as she returned from her highway reconnaissance. The upside was that Lori was able to snap a few pictures during some of the stretches, given that I made her hop off over particularly steep and rocky parts. While a safety measure, this served a functional purpose as well. The crappy [i.e. virtually nonexistent] bike shocks meant all of Lori’s hundred pounds were just enough to make the bike bottom out over particularly bumpy terrain. Though in reality a feather could have put us over the weight edge, it wasn’t particularly an ego booster for Lori, but she handled it like a trooper and welcomed the chance to stretch her legs after a morning of hard riding. Looking back toward the junction where the maintained road bends off to the right. Riding ahead to see if the road improves. There were several sections (like the one above) where the road seemed to improve for a moment. In these cases, I would ride ahead a bit to see how long it lasted — most of the time it didn’t, in which case I’d either sit and wait or turn around and get Lori if possible. The conditions of the road didn’t allow for much sightseeing, in which case Lori was able to take in the surroundings for the two of us, snapping a few pictures along the way. Tired and wishing that the road would hurry up and improve already. One of the wooden-plank bridges along the route. FINALLY, BACK ON BIG, BEAUTIFUL TARMAC!!! (and the mountains are nice too). 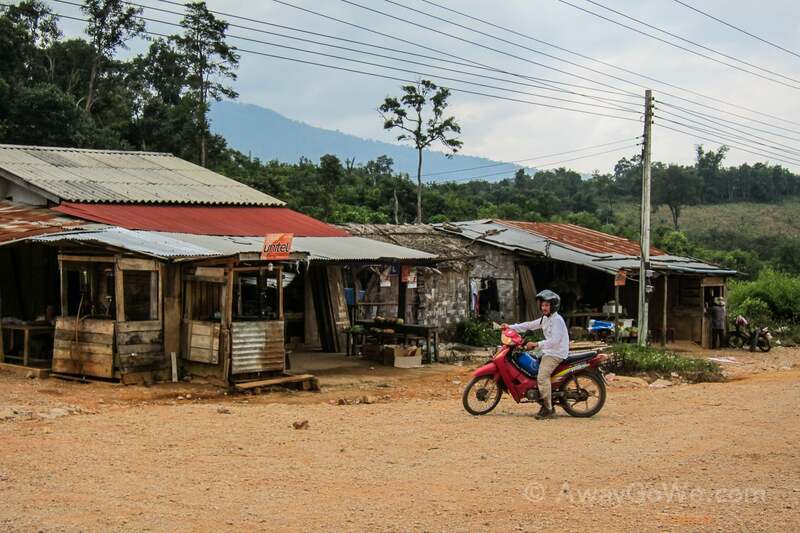 About midday, we rolled into that magical town that had been on the tip of our tongues the entire morning: LAKSAO! Laksao, however, was not what we were expecting. We were certainly happy to be off that wretched excuse for a highway, but were overwhelmed by the hustle and bustle that is Laksao. 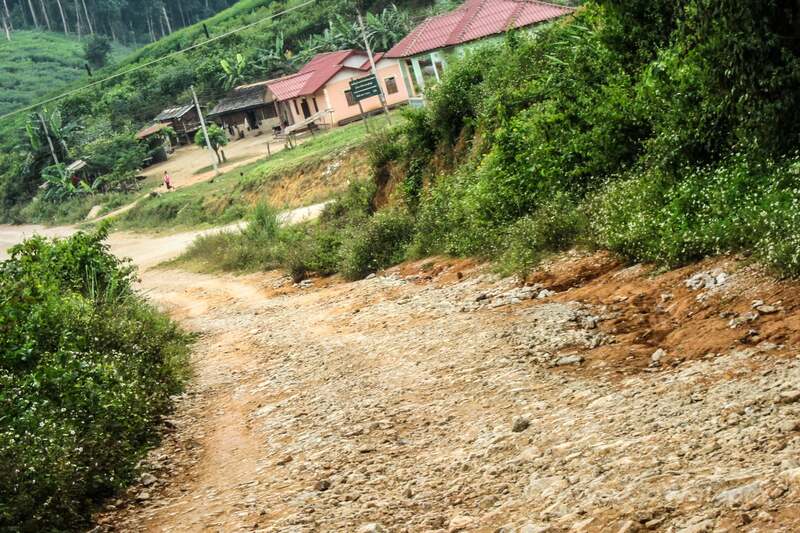 Just miles from the Vietnam border, Laksao is a busy little transit hub — something which we were not prepared for. We managed to find a small Pho restaurant suitable to our discerning tastes (i.e. we were able to discern that it was a restaurant serving food). As was the custom with most establishments along the Loop, there was no menu, just one dish on offer: Soup (pho). Now, I generally don’t care for pho in the States, but the pho in Laos is exquisite, and Laksao was no exception. The proprietor didn’t know what to do with us initially, given that he (and everybody else) didn’t speak a word of English and we didn’t speak Lao. But it was obvious what we wanted, and only one question that needed to be answered. The proprietor left us for a moment before returning with a huge chunk of meat, trying to gauge our level of interest — which was met of course with a resounding YES! 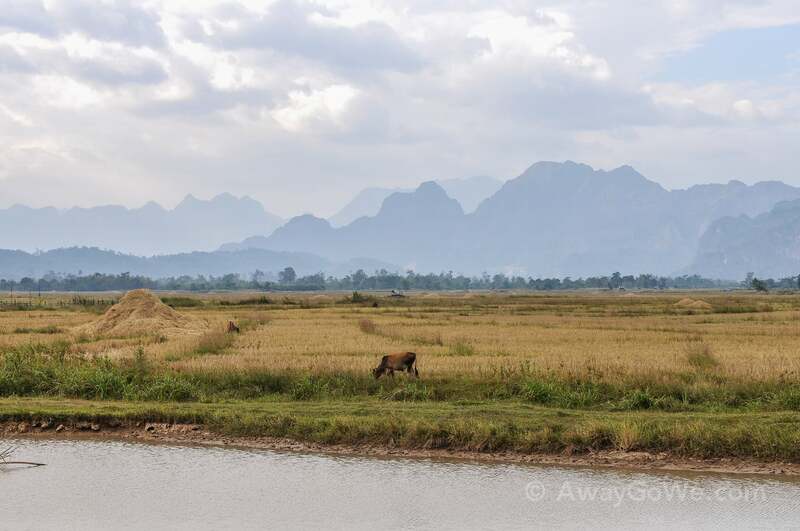 After the tasty and surprisingly filling meal (Lao pho is accompanied by a mind-blowing assortment of condiments and fresh add-ins), we were back on the road, making a bee-line out of town bound, once again, for the quiet and solitude of the Lao countryside. 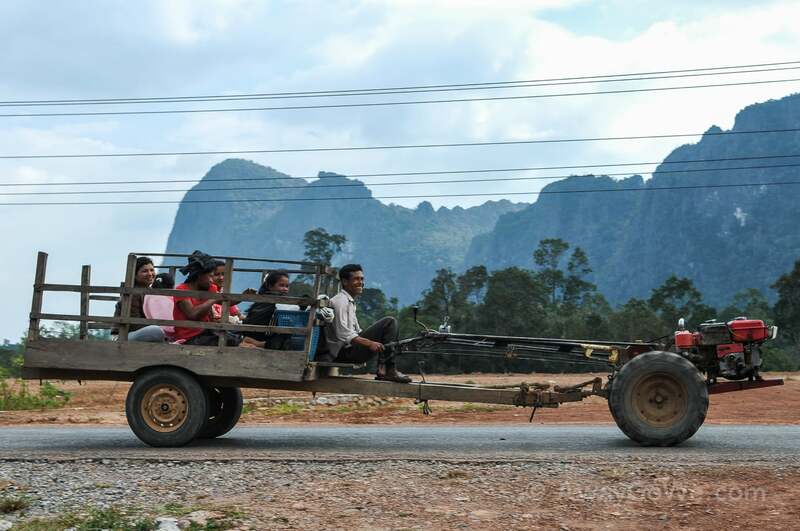 The ever-present, multifunctional Lao-mobile. Use the whole contraption to bus your kids to school or goods to market, or detach the front end for plowing your fields or dragging out a stump. The possibilities are endless. 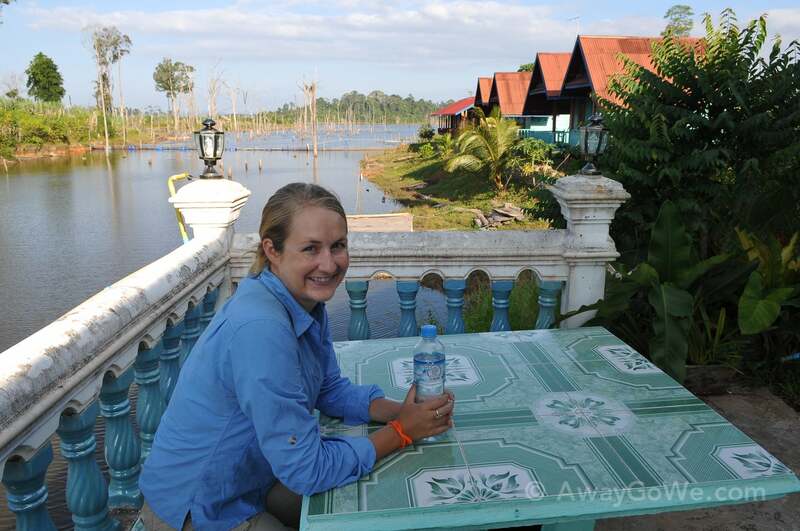 Ever since leaving Thailand, we were yearning for adventure, and redoubled our efforts as such to find it. We wanted desperately to get off the beaten path and get back to what we loved doing — having our own little adventures in less trodden backwaters. We’re suckers for authenticity. Authenticity doesn’t have to be tribal rituals or women meandering in exotic clothing through a colorful market. Most of the time authenticity bares no resemblance to the pages of National Geographic — it’s really life happening with or without the curious eye of the outsider. It’s the beauty of unchecked dilapidation and local alleyway eateries. It’s as much a young girl hand washing laundry in a stream in rural Mozambique as it is a young man moving a load of wash from the washer to the dryer while watching a football match on TV in urban Ecuador. At its very basic (and perhaps, very best) it is life unscripted and unedited, and to partake is one of the primary reasons we travel. So how did we decide on doing the Loop? We had read about the incredible Konglor Cave and thought it might be something we’d want to incorporate into our trip at some point. 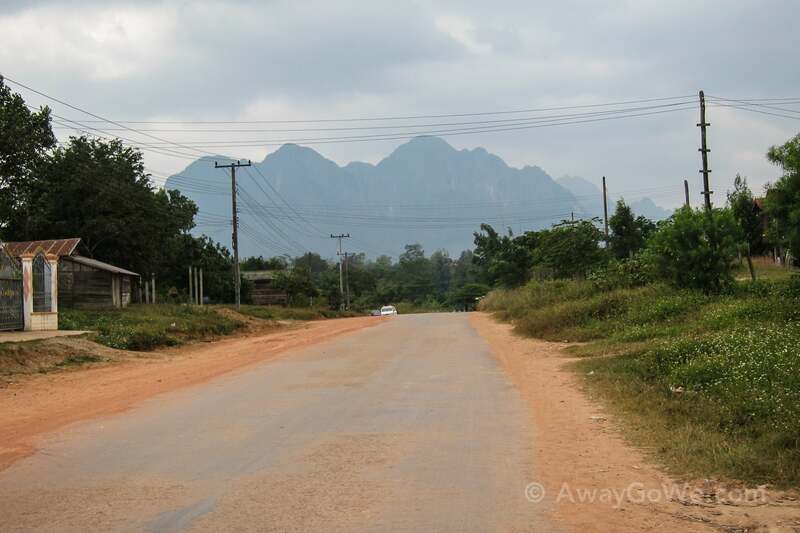 Most visitors seem to get to Konglor via public transport from Thakhek to Nahin, then a songthaew on to Kong-Lo village. After coming across some accounts of motorbiking the Loop to Konglor Cave we initially thought it might be fun to rent a scooter in Nahin and ride the 50 mile roundtrip stretch of sealed road to/from the cave. The more we thought about it, however, it didn’t seem like too far of a jump from attempting the Konglor section on scooter to completing the whole Loop on motorbike. In practice, though, it’s a leap over the Grand Canyon. But boy, were we ever glad we made the leap. So we pushed on beyond Laksao toward an unknown destination. We were hoping to find some hidden little gem of overnight lodging along the route before arriving in Nahin, the next town on the map. 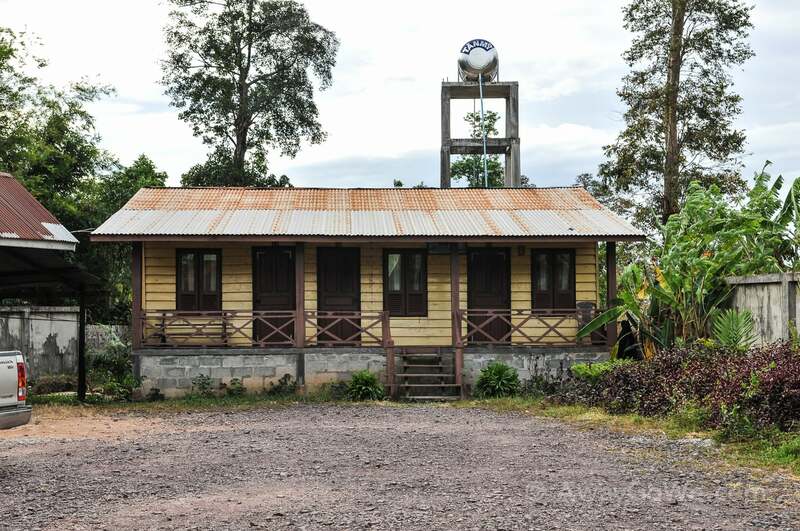 We kept our eyes peeled along the way but didn’t manage find anything remotely resembling overnight accommodation for travelers. But the ride along the way was breathtaking. Taking a breather after scouring this tiny village with amazing views for lodging. But no luck. On to Nahin! 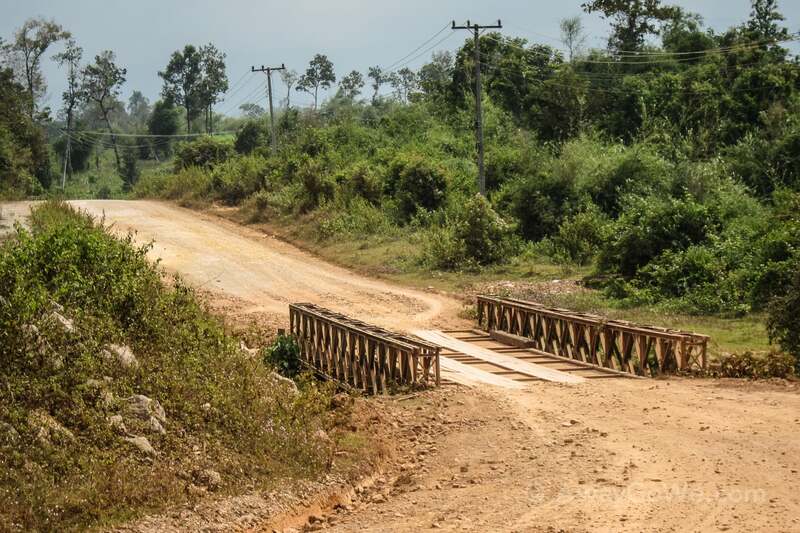 At Tha Bak (Bak village) we came across a long bridge crossing the Nam Theun (Theun River). Below the bridge is something you won’t find in too many other places: Bomb Boats. Click here to read our post on these very unique canoes and the unfortunate history behind them. Covered in filth and grime from head to toe, we rolled into Nahin just in time to catch the sunset. We had written down the name of a resort, but deep down were hoping to find something along the lines of Phosy in Tha Lang. We saw a sign for the resort but decided to head into town to see what else was available. 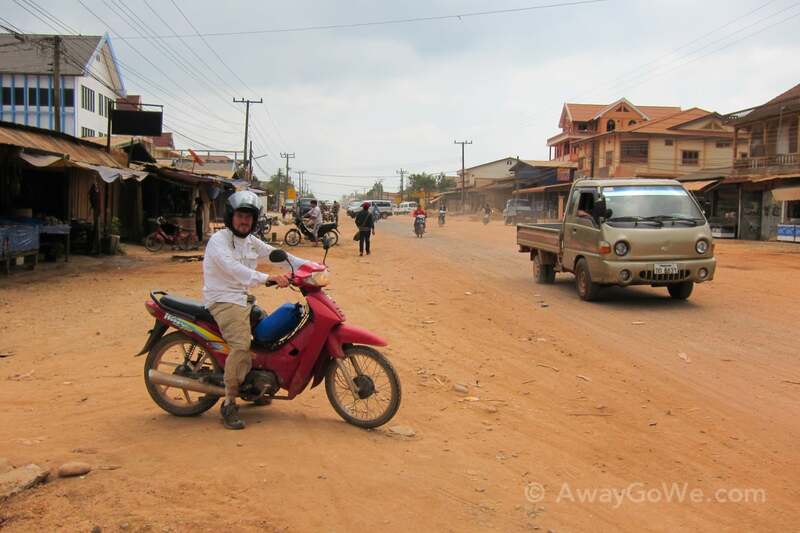 There wasn’t much along the main highway except for Xok Xai Guesthouse. At Xok Xai, we were given the choice between two very different types of accommodation: Uncle Bubba’s cajun country home (above) and The Chateau (below) for a few dollars more. This choice was not difficult. Rooms on the upper floor cost slightly more than rooms below, but the top rooms still ended up coming in at 70,000 kip (around $8.40 USD) per night. These were very nice rooms with A/C, hot water and all of the little touches of a small country inn. Plus, it had a fantastic wooden deck for admiring the lovely view. The grounds and location in town were nothing to write home about, but it was far nicer than anything else we looked at in Nahin (we never made it out to the resort — got about a quarter of the way and turned back). We bought a couple of BeerLao from the Xok Xai restaurant and relaxed on the expansive wood deck until the sun went down. There’s not much going on in Nahin, but just enough to disqualify it as a quaint and rural village setting. 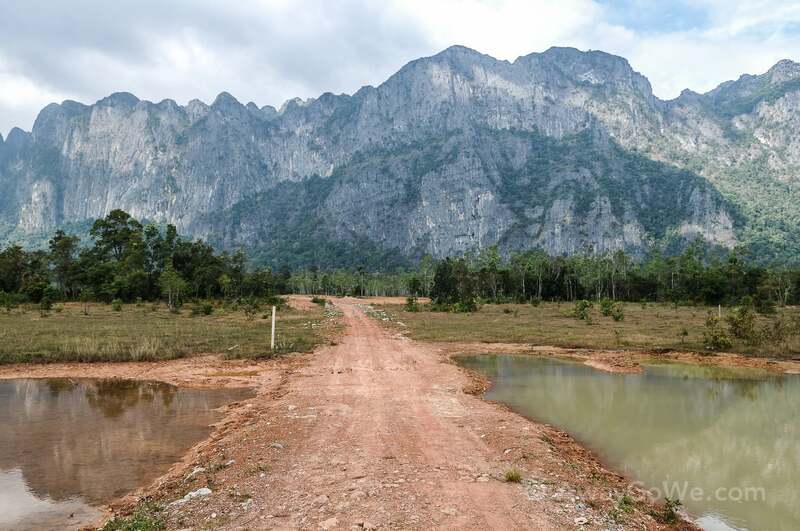 It’s main claim to fame is that it sits near the junction of Highway 8 and the road to Konglor Cave. Tucked back in a small neighborhood off the highway are a half dozen restaurants offering local food and a chance to get your Karaoke on after dark. Exhausted from the day’s journey, Lori and I decided to sit this one out. Nonetheless, the people-watching was entertainment enough as we sat and ate an uninspiring, yet satisfying meal. Afterwards, we retired to the chateau and slept like two incredibly tired logs. Tomorrow, on to Konglor Caves!